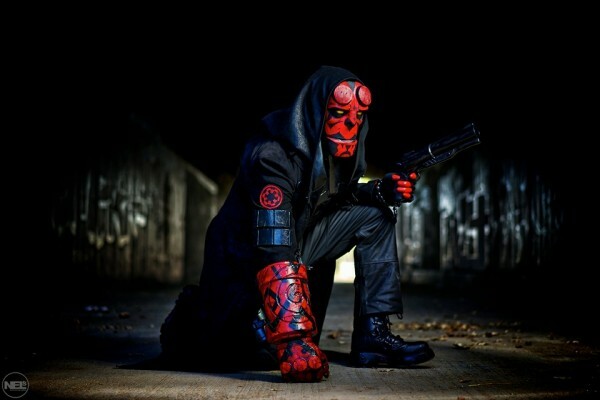 Hellboy Meets Star Wars in Sithboy Cosplay « Adafruit Industries – Makers, hackers, artists, designers and engineers! When you’re scrambling for a cosplay inspiration, it’s never a bad idea to mash together different franchises. At the very least, it’s fun. But sometimes, it’s more than fun. This costume by Luis Linares proves that the mash-up concept can be perfect. He mixed Hellboy from the comic of the same name with Darth Maul from Star Wars. Both characters have red skin and that common thread makes them a natural pair. Sithboy has Hellboy’s body with Darth Maul’s skin markings, a double-bladed lightsaber, and black robes. See more photos of the costume at Luis’ Facebook page.